Author(s) Barnes, A. James; McCrory, Martin A.; Prenkert, Jamie Darin; Langvardt, Arlen W; Perry, Joshua E.
This is the 17th UCC Edition (and the twenty-second overall edition) of a business law text that first appeared in 1935. Throughout its 80 years of existence, this book has been a leader and an innovator in the fields of business law and the legal environment of business. One reason for the book’s success is its clear and comprehensive treatment of the standard topics that form the traditional business law curriculum. Another reason is its responsiveness to changes in these traditional subjects and to new views about that curriculum. In 1976, this textbook was the first to inject regulatory materials into a business law textbook, defining the “legal environment” approach to business law. 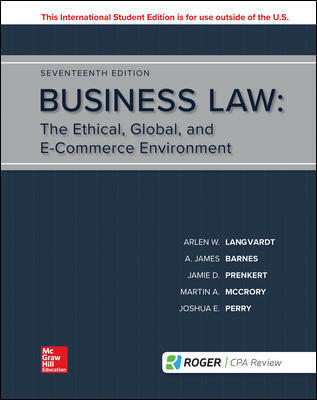 Over the years, this textbook has also pioneered by introducing materials on business ethics, corporate social responsibility, global legal issues, and e-commerce law. The 17th Edition continues to emphasize change by integrating these four areas into its pedagogy.